Eight treated and released after bus flipped on its side in N.C.
A bus carrying the Class A Advanced Carolina Mudcats lost control and flipped on its side early Tuesday morning in Columbus County, North Carolina. Seven players and one team trainer were taken to a nearby hospital and later released, according to WECT-6 in Wilmington. Operated by Abbott Bus Lines, Inc., of Roanoke, Virginia, the bus was taking the Mudcats from Salem, Virginia, where they had just finished a five-game series, to Myrtle Beach, South Carolina, for a three-game set. It's a trip of about 300 miles. Tuesday evening's game has been postponed. Kay Worley, Columbus County's Emergency Services Director, told WECT that the bus crashed around 3:45 a.m. with 33 members of the team on board. 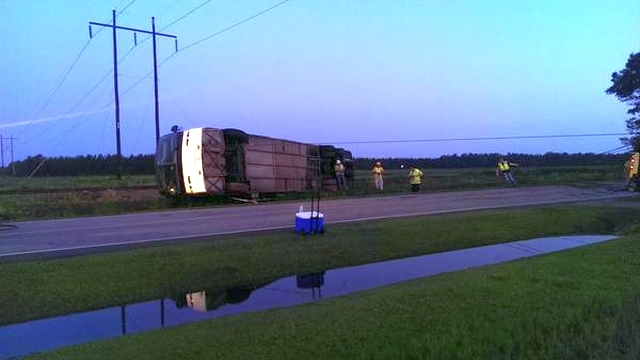 The bus, which had flipped onto its right side and skidded down Clarendon Chadbourn Road, was pulled upright around 6 a.m.
Mudcats director of broadcasting and media relations Greg Young told WECT that he had dozed off before hearing the driver become frantic and lose control. The passengers exited through the hatch in the bus' roof. Young later tweeted, "Thank you everyone for your concern. I can't speak for everyone involved, but I think we are all doing well. As well as can be expected." With Minor League teams traveling thousands of miles by bus every season, often late at night, accidents are a concern. The Class A Short Season Williamsport Crosscutters were involved in a collision in Staten Island, New York, in 2011 that saw six passengers treated at a hospital and released. In 2013, a bus carrying the Elizabethton Twins north from Spring Training was part of a fatal collision near Jacksonville, Florida. No players were injured. Just want to get this out before my battery dies again. The team is all back together now and headed to Myrtle Beach as planned. For reasons related to Tuesday morning's bus wreck, the series between the Carolina Mudcats and Myrtle Beach Pelicans will not be played as scheduled. The three-game series was to begin Tuesday and continue through Thursday at Myrtle Beach's TicketReturn.com Field. The Mudcats team has returned to Zebulon where players and field staff will continue to be medically evaluated. Decisions on rescheduling will be made at a later time.